The right combination of geological factors can take the temperature of hot springs to the boiling point and even higher. Here are some of the hottest springs around the world. 1. Norris Geyser Basin, Yellowstone. 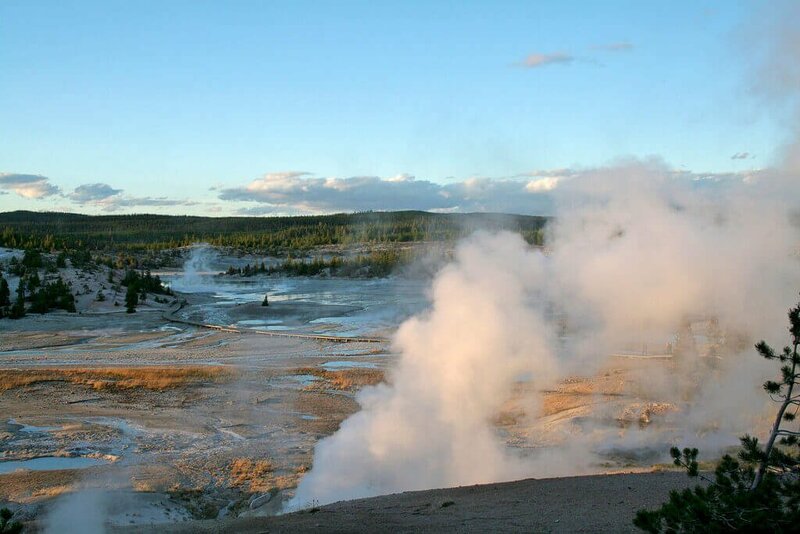 This tallest geyser in the world set the highest temperature ever recorded in the park. It’s so far above sea level that the boiling point is 199°F rather than the sea-level 212°, but a hole drilled by scientists to 1,087 feet deep found a temperature of 459°F. It’s still a cool place, with minerals that create a palette of blue, green, and yellow on the landscape. 2. Yumura Onsen, Hyougo Prefecture, Japan. This spring, with a flow rate of 2,300 liters per minute, is 208.4°F at its source. Local residents cook eggs and other foods that do not release bitter scum at an upper level, mountain and root vegetables at a lower level. 4. Uzon Caldera, Kamchatka Peninsula, Siberia, Russia. This highly volcanic area of the Pacific Ring of Fire has thousands of hot springs, where microbes called extremophiles survive at temperatures just below 212°. They eat organic acetate, starch, or peptides, the fermented residue of organic molecules, and get energy from volcanic sulfur. 5. Source du Par, Chaudes-Aigues, France. The 30 hot springs in this region range from 113°F to more than 176°F, with Source du Par being the hottest of them all, reaching 179.6°F. The site was already a spa in Roman times, and hot water under the village has heated homes and the church since the 14th century. Compared to those extremes, the 16 geothermal pools at Iron Mountain Hot Springs, with temperatures from 99°F to 108°F, are Goldilocks-perfect for health and relaxation.